It was a typical fall morning. The air was cold. The sky was gray. It was exactly the time to have something warm and soulful that would be invigorating from the inside out. As winter progresses my favorite deeply warming breakfast is a hot bowl of oatmeal. Ideally it's steel cut, toasted in butter, and slowly simmered in milk. Eggs don't generally have the same effect. Like toast, their heat quickly dissipates and they cool off far too fast. 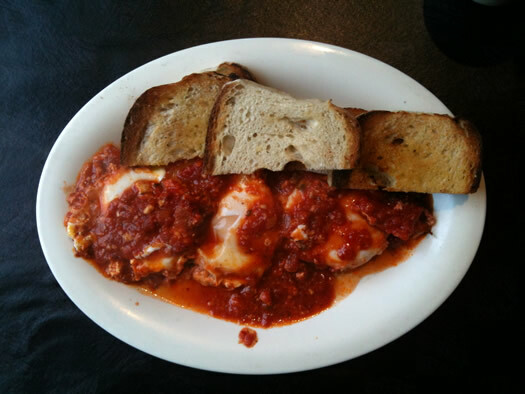 More Perecca's solves that problem by topping three poached eggs with fra diavolo sauce, creating a blanket that not only keeps the delicate eggs warm, but also helps to warm you from within. Because this sauce has a spicy kick and plenty of garlic. It draws on over a century of Italian-American heritage and culture, ignites the senses, and clears out the cobwebs so you can tackle the cold dreary day outside. The heat isn't going to send you into orbit or frantically searching for something to quench the fire. Rather, it smoulders. While this may not be your most typical breakfast dish, eggs and tomatoes are enjoyed all over the world. In the Middle East they enjoy Shakshouka, which is a remarkably similar preparation of poached eggs with spicy tomato sauce. The salsa on huevos rancheros is another variation on the spicy theme. On the less assertive side of the flavor spectrum, English breakfasts traditionally come with a roasted tomato. At Cafe Fanny in Berkeley the amazing open faced egg salad sandwich used to come with strips of sun-dried tomatoes. And even in New Jersey eggs come slathered with saltpepperketchup. For me, poached eggs must contain a runny yolk, so I have adopted the habit of always ordering my poached eggs "soft." And when I cut into one of the deep yellow yolks at Perrecca's and it spilled over the red, piquant sauce in front of a piece of brown toast, it was like the colors of fall unfurled on the plate. Could the toast have been a little more evenly done? Sure. And the poached eggs could have been more thoroughly drained. But I'm being picky. The big thing is that the toast came to the table warm, and everything on the plate was delicious. The restaurant's recent shift away from counter service to table service (even at breakfast), in addition to bringing in a new chef, are also likely factors that have contributed to a better overall dining experience. Now, if you are feeling adventurous you can even follow in Deanna's footsteps and ask that they put your Eggs in Purgatory on one of their coal fired pizzas. They are happy to oblige. But I say to stick with the toast, especially if you enjoy having something to dip in your runny yolks. It's hard to believe, but oatmeal may have finally met its match. And you can bet I'll be back throughout the colder months for this reinvigorating repast. now I'm hungry again. That looks fantastic. Thanks for the shout-out, man! 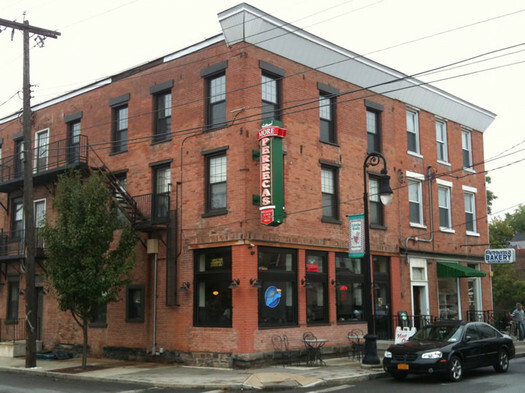 I love that place, especially the Eggs in Purgatory Pizza (Thanks to Julie White Eklund for originally introducing me to that). Delicious anytime of day, paired with a Peroni (just beware of the $4 price mark-up for a readily-available brew). Anytime you want to go back, just give me a holler. Mmmmm might even be worth a trip to Schenectady. If you're liking the eggs and sauce (gravy) then you should try eggs and spaghetti. Next time you're making a good sauce add a raw egg to the cooked, hot sauce, dont stir the sauce anymore, just let the egg sink and sit there simmering. The egg will cook to a nice soft-boiled consistency. Put your cooked egg and suace over some spaghetti and enjoy. mmm. now I know what Im having tonight. I love this dish. I make something similar at home except I brown bulk hot italian sausage from Garofolos, and add sauteed onion and red bell pepper. Add one jar of Ariabetta sauce from Aldi. Once the sauce is hot and bubbling, crack raw eggs into mixture and cover until eggs are done to your liking. Nothing betta than that. Thank you sweet Mary,and invisible Gregg for putting this delicious looking recipie on your wonderous blog! Will try this as soon as i am at the stove creating ,and curing my rainy day blue's! I have to use up a green pepper, so hope to make a meal worthy of a king! More Pereccas went through a rough patch that is (thankfully) over. I had wonderful experiences when it first opened but something happened and the quality became inconsistent. The final straw was when I brought my brother from Connecticut (a big fan of Perecca's bread) there for breakfast and not only were the potatoes boring and awful but the toast wasn't even Perecca's bread...just some white bread. they'd run out of Perecca's bread! WTF? I'm back now since the new head chef has fixed the food. Perhaps I'll try dinner there now that I''ve regained confidence in the place. 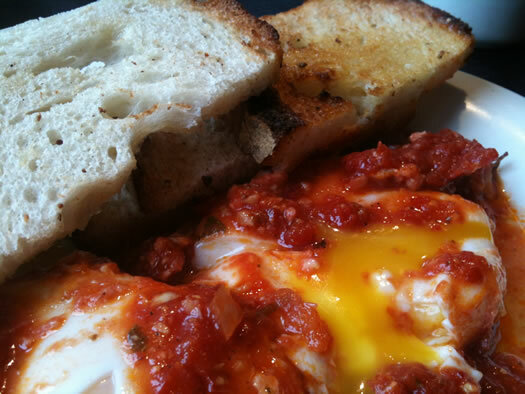 I had the eggs purgatory at Perecca's and I had them put the sausage broken up on top. That sent it to another planet have to try it that way.